The Frontier Fields is a project that combines long observations from multiple telescopes of galaxy clusters. Galaxy clusters contain up to thousands of galaxies and vast reservoirs of hot gas embedded in massive clouds of dark matter. Data from Chandra, Hubble, Spitzer and other telescopes are part of the Frontier Fields project. This Frontier Fields galaxy cluster, known as MACS J1149.5+2233, is located about 5 billion light years from Earth. MACS J1149.5+2233 (MACS J1149 for short) is a system of merging galaxy clusters located about 5 billion light years from Earth. 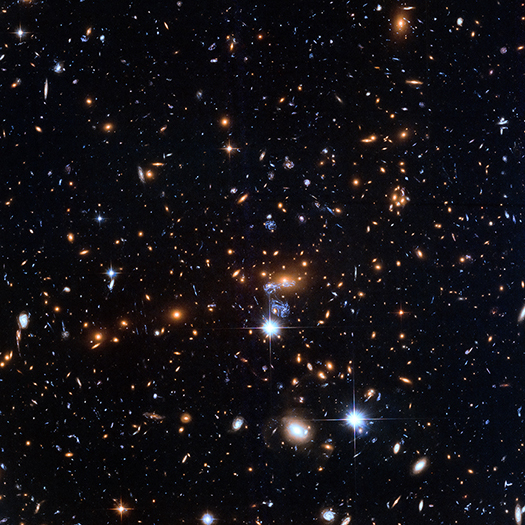 This galaxy cluster was one of six that have been studied as part of the “Frontier Fields” project. 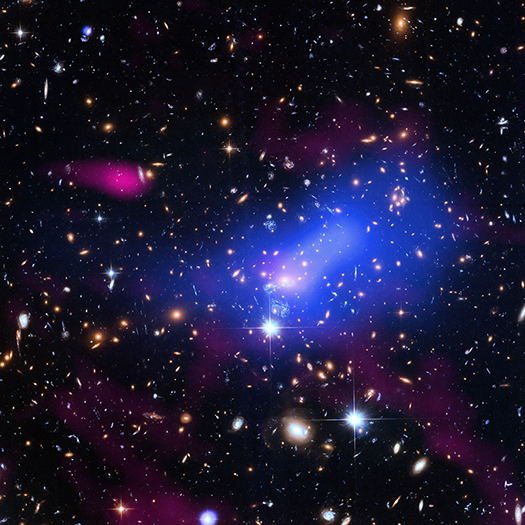 This research effort included long observations of galaxy clusters with powerful telescopes that detected different types of light, including NASA’s Chandra X-ray Observatory. Astronomers are using the Frontier Fields data to learn more about how galaxy clusters grow via collisions. Galaxy clusters are enormous collections of hundreds or even thousands of galaxies and vast reservoirs of hot gas embedded in massive clouds of dark matter, invisible material that does not emit or absorb light but can be detected through its gravitational effects. 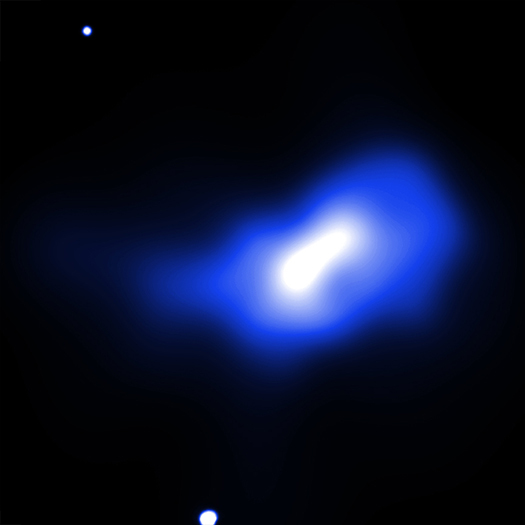 This new image of MACS J1149 combines X-rays from Chandra (diffuse blue), optical data from Hubble (red, green, blue), and radio emission from the Very Large Array (pink). The image is about four million light years across at the distance of MACS J1149. The Chandra data reveal gas in the merging clusters with temperatures of millions of degrees. The optical data show galaxies in the clusters and other, more distant, galaxies lying behind the clusters. Some of these background galaxies are highly distorted because of gravitational lensing, the bending of light by massive objects. This effect can also magnify the light from these objects, enabling astronomers to study background galaxies that would otherwise be too faint to detect. 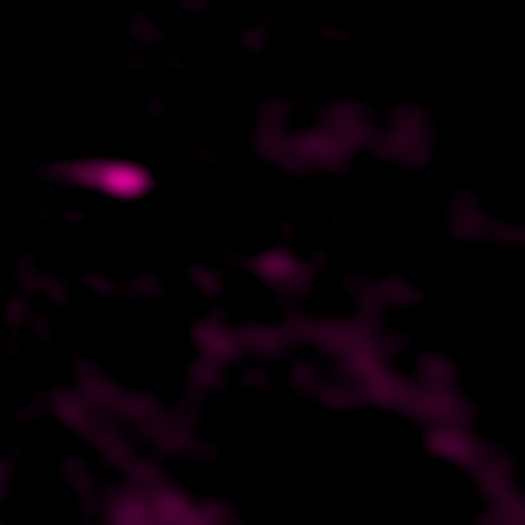 Finally, the structures in the radio data trace enormous shock waves and turbulence. The shocks are similar to sonic booms, and are generated by the mergers of smaller clusters of galaxies.